Animals, plants, and even bacteria, have a defense system that is able to detect and neutralize dangerous invaders and protect the organism from diseases. Our immune system consists of several defense barriers that protects us from pathogens (bacteria, virus, fungus and parasitic worms). ​ The first line of defense against pathogens are physical barriers. Our skin and other organs secrete anti-microbial enzymes, and gastric acid in the stomach provides a powerful chemical defense. The second line of defence are immune cells (white blood cells) and molecules that provide signals between the immune cells. White blood celles count for 0.7% of the total blood volume. ​ The immune system is divided into the innate immune system and the adaptive immune system​. They are described below. The immune cells can be regarded as superheroes. Each one of them have special skills to fight intruders. The Innate Immune System provides an immediate, but non-specific response to invading pathogens. The innate response is usually triggered by receptors that recognizes the general shape of the invading pathogens or when damaged cells send out alarm signals. ​ One of the first responses to infection is inflammation, which indicates increased blood flow. Inflammation is produced by signalling molecules, such as cytokines, which are released by injured or infected cells. These cytokines recruit immune cells to the infection site. ​ The innate immune system utilizes antibodies (proteins called immunoglobulin) to mark pathogens. The antibodies stick to the surface of the pathogens, making it easier for the immune cells to identify the pathogens. 1) Inactive neutrophil, 2) Neutrophil ingesting a bacteria (phagocytosis), 3) Neutrophil releasing toxic granules to kill a bacteria (degranulation), 4) Neutrophil using extracellular traps (NETs) to trap and kill a bacteria. 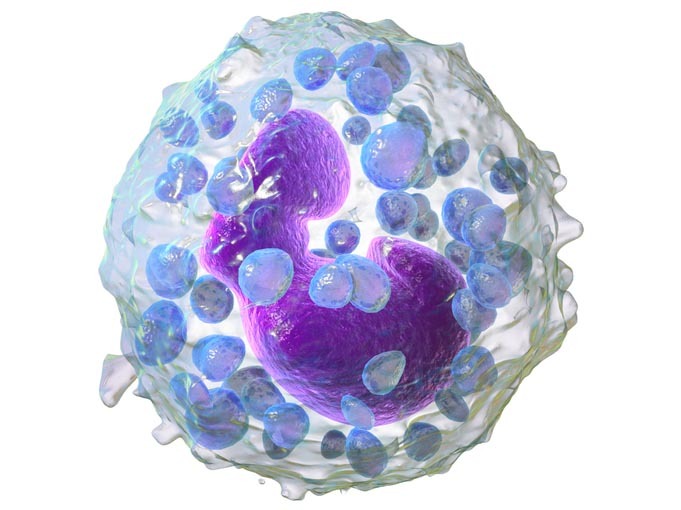 Neutrophils are the most abundant type of immune cells (40% to 75%). They are one of the first responders to the site of injury and are responsible for inflammation, which increases the blood flow. 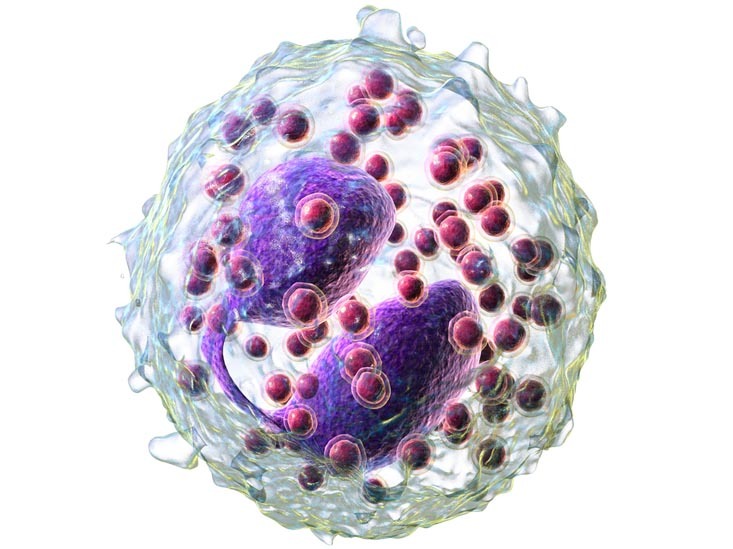 Neutrophils can ingest bacteria and particles in a process called phagocytosis. They can also release toxins to kill pathogens and some cancer cells in a process called degranulation. Third, they can release web fibers that trap and kill microbes in a process called Neutrophil Extracellular Trap (NET). ​ Neutrophils have a preference to engulf refined carbohydrate (sugar) over bacteria. A diet with high sugar intake will therefore reduce the neutrophils' ability to kill pathogens. ​ Low quantity of neutrophils increases the risk of infections. This condition may be caused by anemia or leukemia (blood cancer), or it can be a side-effect of medication such as chemotherapy. ​ Macrophage means "big eater" in Greek. Macrophages are found in almost all tissues in our body and acts as caretakers.​ They engulf and digest foreign materials, such as dead cells and pathogens, in a process called phagocytosis. 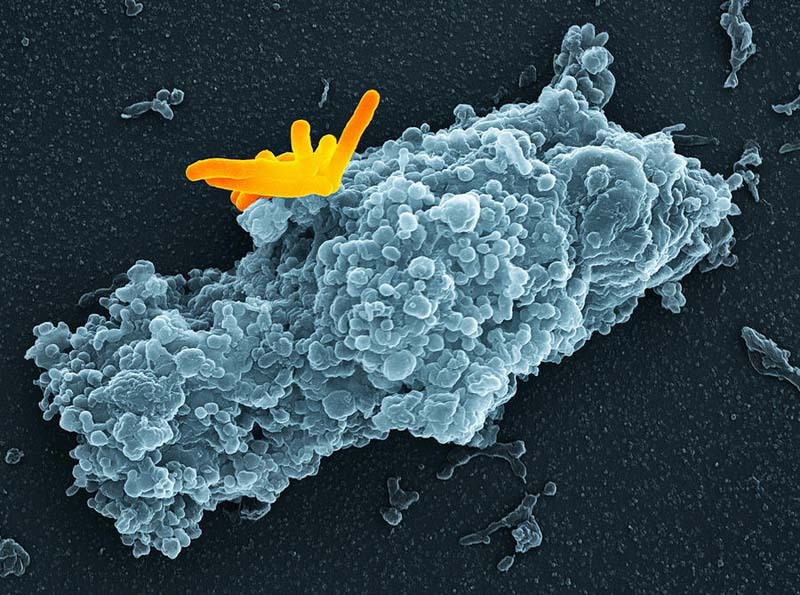 ​ Macrophages involved in killing pathogens and promoting inflammation are called M1. When digesting pathogens do macrophages send signals to recruit other immune cells to the site of injury. They also release antigens, which are proteins from the surface of the pathogen. The antigens are processed by dendritic cells (see below) to become anti-bodies, which in turn makes it easier for other immune cells to identify pathogens. ​ Macrophages involved in healing processes, such as repairing wounds and regenerating muscles, are called M2. ​ Some pathogens are able to survive inside the macrophages, where they are hidden from other immune cells and can multiply. Examples are tuberculosis bacteria and HIV (Human Immunodeficiency Virus). Mast cell releasing chemicals. The blue "propellers" are antibodies. Mast cells contains many granules and are rich in histamine. They are present in most tissues surrounding blood vessels and nerves, for example the skin, the mouth, the nose and the lungs. ​They are also in the brain, where they interact with the neuro-immune system, which is explained later. ​ Mast cells are involved in immune tolerance, defense against pathogens, wound healing and formation of new blood vessels. ​ Mast cells play a key role in allergic reactions. First time an allergy prone person is exposed to an allergen, for example pollen and fungi, the immune system makes large amounts of antibodies. Those antibodies attach themselves to mast cells. Next time the person is exposed to the allergen, the affected mast cells release granules and powerful chemicals, such as histamine and cytokines. The chemicals cause inflammation and other characteristic symptoms of allergy. It is believed that this reaction has evolved as a defense system against parasites and bacteria. Eosinophils are fighting multicellular parasites and infections. They also control mechanisms associated with allergy and asthma. ​ They are found in the brain stem, thymus, intestines, spleen and some other internal organs. Eosinophils appears red because small granules inside the cell are colored by a dye called eosin. The granules also contain histamines and proteins, which are toxic to both pathogens and normal tissue. ​ Eosinophilia is a condition when there are too many eosinophils (more than 500 per ml blood). The most common cause is an allergic reaction, such as asthma. Basophils are few in numbers and appears mostly in connective tissue. Like eosinophils, do the basophils play a role in both parasitic infections and allergies. Basophils appear in many inflammatory reactions, particularly those caused by allergy. Basophils contain an anticoagulant that prevents blood from clotting too quickly. They also contain histamine, which promotes blood flow to tissues. They can be found in high numbers at sites of parasite infections, for example those from ticks. NK cells (blue) attacking a cancer cell. Natural Killer cells - NK cells are very important, because they can attack unmarked, infected cells without waiting for them to be marked with antibodies. In contrast can immune cells in the adaptive immune system only attack infected cells that are marked with antibodies. NK cells also attack tumors and is therefore our first line of defense against cancer. Some types of cancer are able to excrete decoy signals that prevent attacks from NK cells. One example is prostate cancer. The weapon of the NK cells is toxic granules, which are injected into the infected cells. During this process are cytokines released, directing more NK cells to the area. 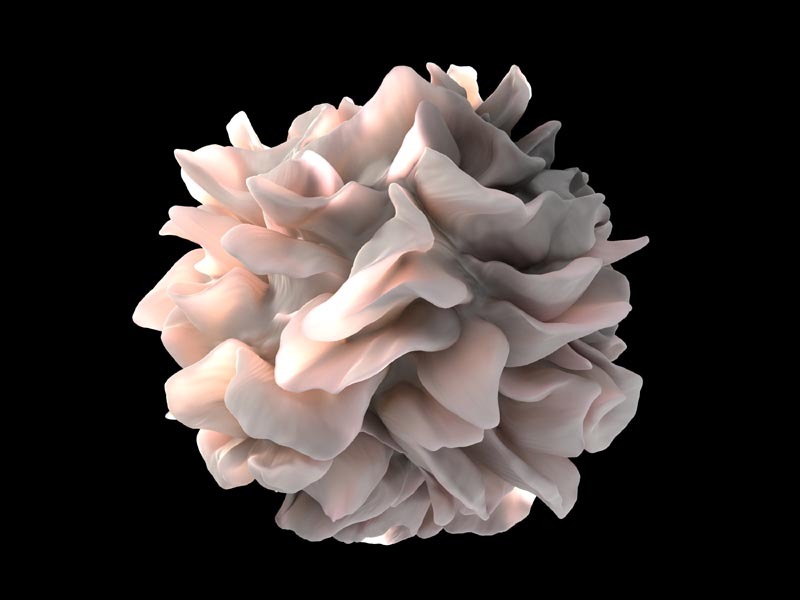 Dendritic cells are antigen-presenting cells and act as messengers between the innate and the adoptive immune system. They process antigens and present them to the T cells. They are present in tissues that are in contact with the external environment: Skin, nose, lungs, stomach and intestins. They move around in the lymphatic system and interact with B and T cells (see below). ​ Dentric cells are also called Langerhans cells, after Paul Langerhans, a German pathologist, biologist and physiologist living in the 19th century. The Adaptive Immune System comes into action when the pathogens has evaded the innate immune system. The adaptive immune system is, as the name suggests, able to adapt over time to recognize specific pathogens more efficiently. It creates a memory after an initial response to a specific pathogen, leading to an enhanced response to subsequent encounters with that same pathogen. Vaccination is based on this process of acquired memory. However, pathogens can rapidly evolve and mutate, and thereby avoid detection and neutralization by the immune system. An example is the flu virus, which through mutation can change its properties from one year to another. New vaccine must therefore be developed to protect against new virus mutations. B cells are also known as B lymphocytes. They use antigens to transform to plasma cells and produce antibodies, which attach to pathogens and serves as markers to attract other immune cells. In some cases do helper T cells trigger this process. ​ Some B cells evolves into memory B cells, which persist for several years after an infection. When exposed to their cognate antigen, they quickly transform to plasma cells and release antibodies. The function of a B cell: (1) Bind to an antigen, (2) receive help from a helper T cell and (3) become a plasma cell and (4) release antibodies. 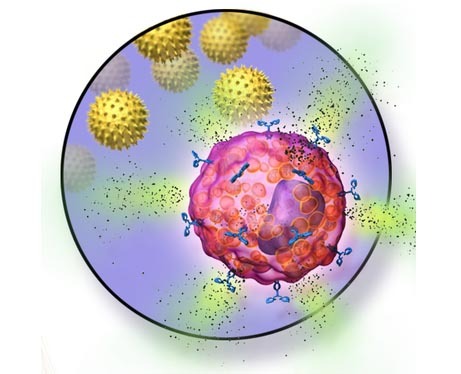 Helper T cells assist other white immune cells, including maturation of B cells into plasma cells and memory B cells (see above), and activation of cytotoxic T cells and macrophages. ​ Cytotoxic T cells destroy virus-infected cells and tumor cells. These cells recognize their targets by binding to antigens that are present on the surface of the virus-infected cells and tumor cells. 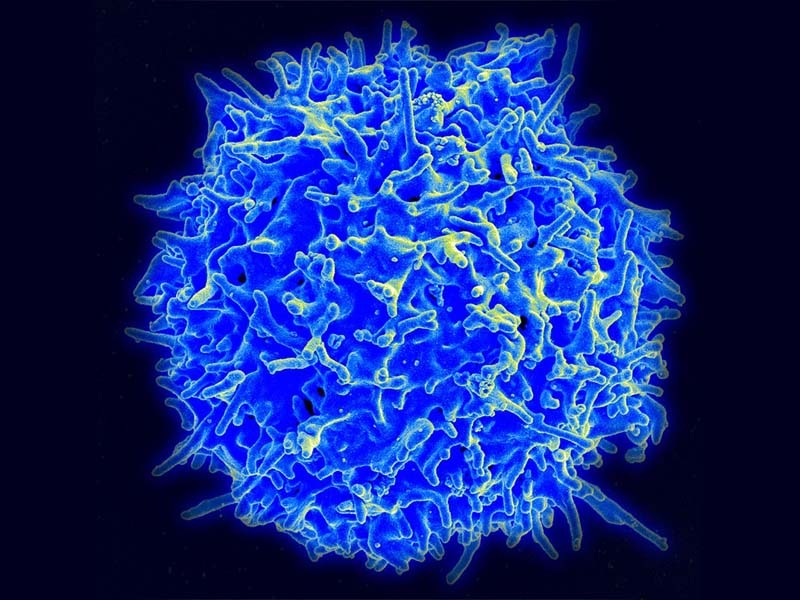 Memory T cells persist for several years after an infection. When exposed to their cognate antigen, they quickly expand to a large number of effector T cells. Vaccines work in the same way: They are made of dead viruses or components of microorganisms, and when injected into the body, they promote production of memory T cells. 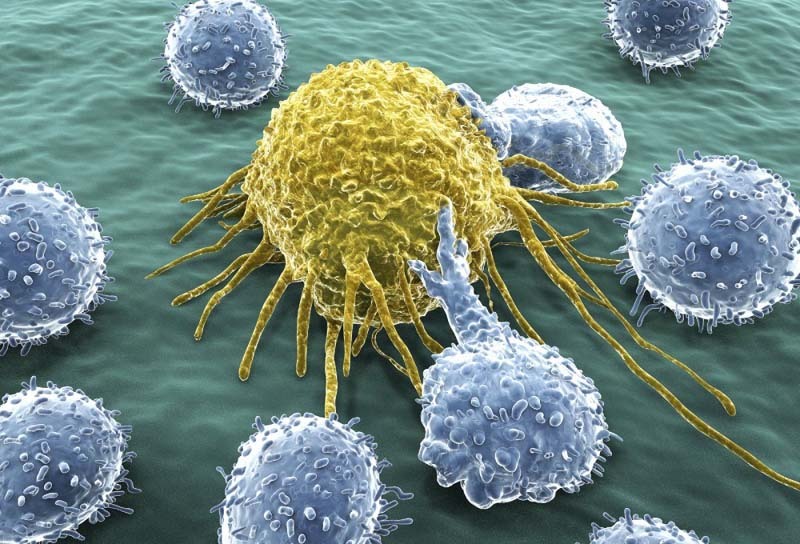 ​ Suppressor T cells regulate the number of active T cells, thus preventing overreaction. T cell deficiency may result in several diseases and syndromes. AIDS results in partial destruction of T cell function. T cell deficiency can also be caused by Herpes virus, fungal infections and Listeria bacteria. Immunodeficiency occurs when one or more of the components of the immune system are inactive. 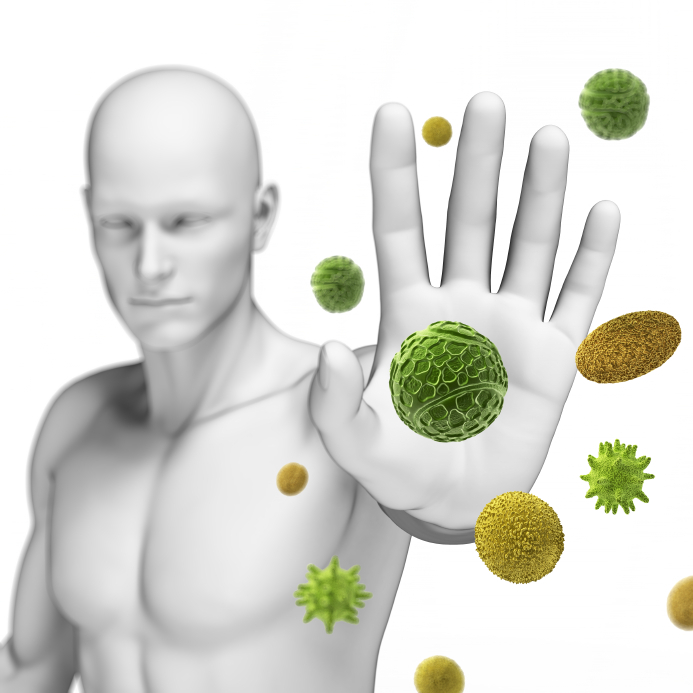 Common causes of poor immune function are malnutrition, obesity, alcoholism and drug use. Immunodeficiency can also be caused by cancer chemotherapy and illness, such as AIDS and cancer. Hypersensitivity is a set of undesirable reactions produced by the normal immune system, including allergies and autoimmunity. These include allergy, asthma and rheumatic heart disease. ​ Autoimmunity occurs when a hyperactive immune system attacks normal tissues as if they were foreign organisms. Common autoimmune diseases are type 1 diabetes, narcolepsy, rheumatoid arthritis and multiple sclerosis.